While browsing the "Check out our new books!" rack at the library last year, I stumbled upon a local author named Michael Perry, hailing from northwest Wisconsin. I am always drawn to local writers, perhaps mostly because I like Wisconsin and have never felt ashamed of cows or cheese or the Green Bay Packers. You throw in the Violent Femmes and Harley Davidson, and you've got a powerful mix of chest-swelling awesomeness right there. So I flipped over this local author, figuratively, and read what it had to say on the back cover. 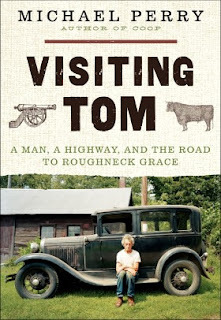 "New York Times best-selling author... a sensitive New Age Hemingway... sometimes comic, sometimes sad... the real deal." Well, I thought, Hemingway had his moments, and the book went into the tote bag. 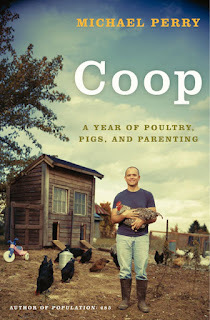 After reading that first book entitled Visiting Tom, I have subsequently read several of Perry's other books including, Population: 485; Truck: A Love Story; and Coop: A Year of Poultry, Pigs and Parenting. The Little Rancher has read his young adult novel, Scavengers, and squealed with delight when I told her a sequel was in the works. And I am pleased to say that all the back cover gushing was correct. Perry is the real deal. 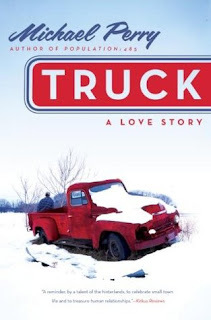 Many other local authors have churned out books about their childhoods in rural Wisconsin, their days on dairy farms, doing chores in the dark winter mornings, baling hay in the falling summer dusk, but more often than not, it's like paging through a copy of Reminisce magazine. It is so cliche and stereotypical, overly polished and perfect, I keep trying to take off my rose-colored glasses to read between the lines. I suppose if you grew up a city-kid, this would all be entertaining, but having grown up on a farm and still living it today, my eyelids droop involuntarily, and perhaps my eyes roll just a bit, when I get into the chapters about how, during evening milking, the farmer squirts milk directly from the cow's udder to the cat's mouth. **stifle yawn** If an author has nothing new to bring to the conversation, then perhaps his stories are best left to a front porch retelling to the grandkids after Sunday dinner, preferably with a long piece of reed grass sticking from the corner of his mouth. Throughout his books, Perry does talk about milking, baling, slopping the pigs, chasing chickens and watching his mother prepare meals like a messhall cook for a family of nine - or eleven, I forget. And, yes, all these memories fall squarely into the realm of cliche, but somehow it doesn't read that way. Perry is able to rub off the polish, add humor and a bit of farmhouse grit, and keep the whole story moving in such a way that you want to know what they do on the front porch after dinner. In some ways his stories are of the Every Man, but in other ways, they are unique enough to provide the Reader with a slightly different angle through the rural Wisconsin six-pane barn window. Last week I had the great privilege of hearing Perry speak at the technical college. The auditorium was near capacity, and having gone alone, I sat down next to a grey-haired woman holding on her lap a home-sewn purse and struck up an easy conversation. I commented on her purse, and she commented on my burlap skirt. We both laughed our way through the next hour and ten minutes while Perry talked about how he got into writing, walking us through some of his research projects and methods of finalizing a book for publishing. Closing with a few well-worn anecdotes, we laughed until we cried. Perry admitted that he was coming to a point in his career (I believed he employed air quotes every time he said the word "career," but honestly, I think he should just own it) where he was either repeating himself or contradicting himself. Admittedly, I recognized the stories as they were taken straight from his books, but the punchline was only made a bit sweeter in the telling. What family doesn't like to rehash their time-honored favorites again and again? After the lecture on his "career," Perry graciously sat for almost another hour and signed books and cds (his band, the Long Beds, twangs out some pretty nifty folk country). Not being on a schedule and needing extra time to work up my nerve and slow down my breathing, I hung back until the end of the line neared his table. I'm sure the cloud of infatuation surrounding me was nearly palatable when I stepped forward and presented him with a red bandana to sign. Unconventional perhaps, but I haven't decided which one of his books is my favorite and might have to do a quick re-read before I settle on one to adorn my shelf. Plus, I figured I couldn't go wrong with fabric. I can always sew it into something; an egg-gathering apron, a front pocket on a pair of bib overalls, a book cover or tote bag. He signed his name, and I mumbled about how I loved his books and his bit about playing Poohsticks as a young boy made me smile because I play Poohsticks with my kids. Incidentally, Poohsticks is a bonafide thing, and Great Britain holds a competition each year. But all too soon the event promoters whisked him away for more photos, and my brush with greatness was over. I drove home, listening to the Long Beds, pondering what to do with my bandana. My husband suggested simply tying the revered bandana on my head and cranking out some New York Times best-selling books. I opted for a tote bag. I am one of those old school sticklers who refuses to purchase an electronic book device (translastion: Kindle) and who noticeably shudders when someone talks about "bookless libraries." I like paper, preferably lots of it, glued together with a pretty wrapping, something that will creak and crease under my fingers. I like the weight of said paper filling my tote bag under the assumption that my sheep will take care of themselves and I will be free to read from one end of that pretty wrapping to another, uninterrupted, naturally. So for this library-going tote bag, I found a piece of nice pillow ticking (nothing but the best for this project) and used the bandana for a front pocket. A single long strap slung over my shoulder makes for a comfy messenger bag. And yes, Michael Perry scribbled his signature as well as his immortal words of wisdom, "Never stand behind a sneezing cow." Apparently this whole cow business dates back to the early days of magazine columns and public radio spots, and from what I can tell, has worked pretty well for Perry. Another well-worn anecdote that never gets old. 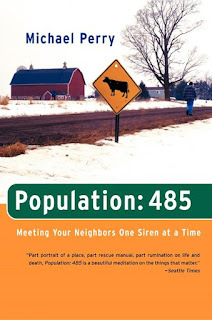 Michael Perry can be found on facebook, if you need a daily dose of rural humor, or at his website, Sneezing Cow, (see what I mean) if you need to purchase his books or music. I guarantee that his writings will take you back and make you smile, make you pause and celebrate your own Wisconsin life. Is there any particular order I should read the books or, was your order the correct one? Would you recommend a different order? I'd like to read without having to face stories that contradict themselves but still get his final idea as the last one to have the end stage of the evolution of his thoughts. You'd have to check the publishing dates to see which order he wrote them. 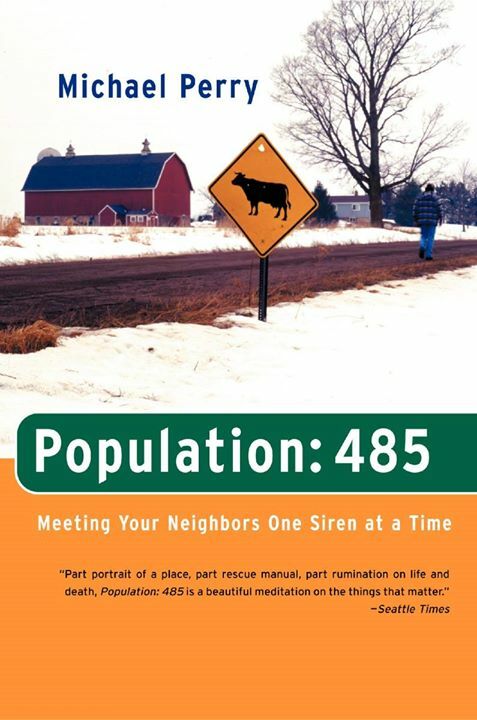 "Visiting Tom" can stand alone, but "Population: 485," "Truck" and "Coop" need to go in that order as Perry talks about being single, getting married and having a child. I also just finished "The Jesus Cow" which is non-fiction although you can tell that he stills leans heavily on his own experiences. There is also a book titled "Big Top" (or something similar) which is a collection of his editorial columns but a lot of those anecdotes are repeated in the above mentioned books so it's a fun read but a bit repetitive. Wherever, however you start reading Perry, you'll enjoy it! Perfect for laid back Summers!